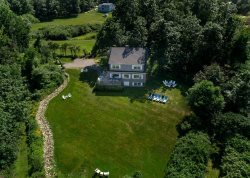 Wells Beach/Moody Marsh Beauty - Sleeps 14! *NOTE: The "Total Price" in the Instant Quote box includes your REFUNDABLE security deposit of $500, the 9% Maine State Lodging Tax, and other applicable fees. 6 Bedrooms! You heard right! This home boasts 6 bedrooms that have beautiful marsh views from each and every one. Almost every room in this house looks out onto the peaceful and quaint marsh. There are 5 bathrooms - 2 with tubs! This home can be split into 2 separate units, so you get the bonus of 2 full kitchens. With 4 Decks and a fire pit down on the marsh-side lawn, this home is a great get-away for the whole crew to gather at. If the stunning marsh views didn't sell you, this home is a mere 2 minute walk from the sandy beaches of Moody Beach in Wells! Get the best of both worlds! !